A dietary supplement to support muscle relaxation and normal sleep. * A synergistic combination of Valerian Root, Amino Acids, Herbs, and B Vitamins to aid in relaxation. Other ingredients: microcrystalline cellulose, stearic acid, vegetable stearate, croscarmellose sodium, hydroxypropyl methylcellulose, silicon dioxide, polyethylene glycol. 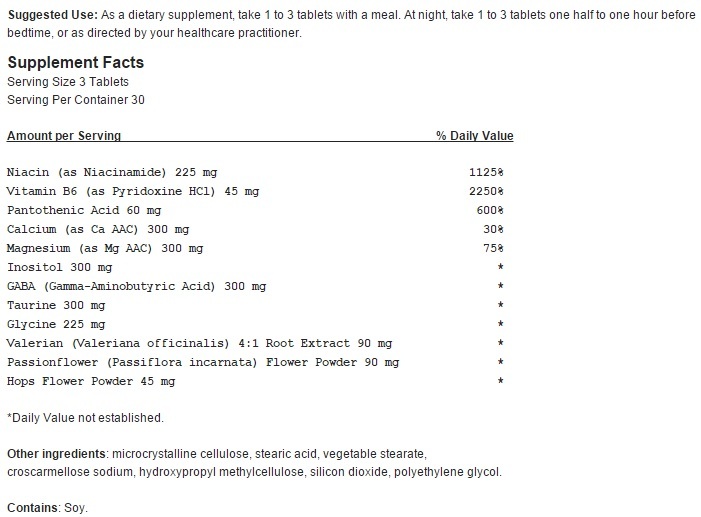 Suggested Use: As a dietary supplement, take 1 to 3 tablets with a meal. At night, take 1 to 3 tablets one half to one hour before bedtime, or as directed by your healthcare practitioner.